Do animals know that other creatures have a mind? Do they know that other creatures see, hear, know, intend, or believe? And how can we know if they do? These questions have been central to a debate that involved philosophers and cognitive scientists for over thirty years now. With his Mindreading Animals, Robert W. Lurz aims to provide an answer to the last question in particular. More precisely, he aims to provide experimental protocols that can tell us whether animals attribute mental states in those cases in which the alternative hypothesis that animals are merely behavior readers is at hand. In the first chapter, Lurz introduces the problem of animals' mental states attribution, hence forth animal mindreading. He emphasizes the relevance of the debate and provides the reader with a historical background that serves as a ground for the comprehension of the main issues at stake. It is not controversial that humans can attribute mental states, but whether animals can do the same is not yet a settled matter, though it is a matter of great relevance. It is relevant to the study of animal minds, to the moral status of animals, to philosophical theories on the nature of the mind, and to the study of human mindreading. 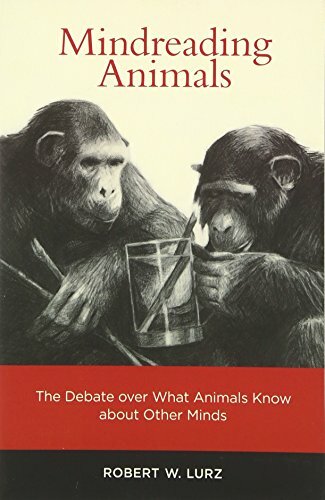 Although there has been some prior interest in animal mindreading, David Premack and Guy Woodruff are considered the fathers of the debate since they published in 1978 their landmark paper 'Does the chimpanzee have a theory of mind?' In which they describe a series of experiments that, according to them, showed that the chimpanzee Sarah was able to attribute intentions and goals to her trainer. Moreover, they introduced the so called "knower-guesser" experimental protocol for testing animal mindreading, in which chimpanzees are required to discriminate between a "knower" and a "guesser" in order to be able to pick the food hidden in one of two containers. Despite the many positive results obtained on animals with several mindreading tasks, many researchers – e.g., Heyes and Povinelli – remain skeptic on animal mindreading. The main reason behind this skepticism is that, as Dennett (1978) among others pointed out, an underlying difficulty for testing animal mindreading is to distinguish genuine mental states attribution from the attribution of observable cues that serves as evidence for such mental states in others, the "logical problem" of animal mindreading (Hurley & Nudds, 2006) to which Lurz aims to find a solution. The second chapter is devoted to a detailed discussion of the logical problem. Lurz argues that no current experimental approach is capable of distinguishing whether animals predict others' behavior by attributing mental states (mindreading hypothesis) or by knowing – from experience, by inference, or innately – that certain features of the agents or their environment are reliable indicators of their future behavior (behavior-reading hypothesis). After contrasting the two hypotheses, he proceeds to examine the current protocols to test perceptual states attribution, knowledge and ignorance attribution on the basis of perceptual attributions, and belief attribution. To the first group belongs Hare and colleagues' famous competitive paradigm experiment. In this experiment, a dominant and a subordinate chimpanzee compete for food. The subordinate is shown that it can take the food only when it is visibly and physically inaccessible to the dominant, for otherwise the dominant would invariably retrieve it. Hare and colleagues reasoned that if the subordinate could attribute the mental state of seeing, then it would anticipate the dominant' s behavior and take only the food not accessible to the dominant. However, Lurz argues, the behavior-reading hypothesis can also explain the positive results obtained by Hare and colleagues. Indeed, it is possible that the subordinate observed that, in the past, the dominants always ate the food to which it had a direct line of gaze, and thus the subordinate knew that the other food could be retrieved. In the studies testing knowledge/ignorance attribution knowledge is understood in terms of attribution of past states of seeing. Animals are interpreted as attributing knowledge to an agent, e.g., if they appear to understand that the agent saw where an object was hidden. However, Lurz argues, since judgments about whether an agent saw an object being hidden rest upon judgments of whether the agent had a direct line of gaze to that object, we can provide a behavior-reading explanation in terms of the animal predicting the agent's behavior by observing the agent's line of gaze. The chapter ends with some remarks on goal-directed and intentional-action attribution in animals. The author argues that it is possible for an animal to be able to attribute goal-directed and intentional actions without being able to attribute mental states such as seeing, knowing, and believing. Indeed, animals might understand that an agent performs a certain action to fulfill a certain goal just by understanding that such an action leads to that goal. In the third chapter, the author proposes a way out of the logical problem for perceptual state attribution. Firstly, he argues against the pessimist thesis that sufficient theoretical and empirical grounds have been provided against animal mindreading, and therefore solving the logical problem is pointless. Secondly, he proposes a general framework for solving the logical problem. He argues that what is needed is an experimental protocol in which an animal is tested on anticipating an agent's action on the basis of some observable fact such that, from the setup of the experiment, it is plausible that the following conditions obtain. First, that the animal has a reason to believe that some observable fact is an indicator of a certain mental state in the agent. Second, that the animal has reason to believe that such a mental state would lead the agent to perform a certain action. Third, that prior to its anticipation of the agent's behavior, the animal has no independent reason (e.g., previous observations) to believe that the observable fact will lead the agent to perform the relevant action. What is needed then is an experimental protocol in which the predicted behavior of the agent is novel relative to the observable cues that the animal is hypothesized to use for attributing a certain mental state to the agent. In Lurz's opinion, this experimental protocol might be created for attributing perceptual appearing, and if animals are capable of attributing states of perceptual appearing, then they must also be capable of attributing simple seeing. An important issue tackled here is how animals might come to possess concepts of perceptual appearing, such as seems or appears. Consider a case in which an animal sees a leaf. If the animal comes to know that there is no leaf before it but an insect then it has reason to doubt of its visual system's accuracy. Consequently, it is possible that the animal's perceptual system instead of causing a belief about what the animal sees – i.e., a belief of having a direct line of gaze to a leaf – it would cause a belief about what it seems to see – i.e., a belief of having a direct line of gaze to what seems to be a leaf. According to the author, a process such that illustrated by this example underlies the acquisition of the concept of seeming or appearing as. Returning to the issue of how animals attribute seeing as, Lurz believes that this is done by some analogical or similarity-based process. After recognizing that a certain object F seems to it to be a different object G, the animal is able to represent itself as having a direct line of gaze to an object F that seems to it to be a G. Thus, when it sees a conspecific C having a direct line to F, the animal compares C to its self-representation and consequently represents C as self-representing as having a direct line of gaze to a G. Thus, the animal ascribes to its conspecific the mental state of seeing as and it can use it to predict its behavior. At the end of this chapter, Lurz presents three experimental protocols involving illusory settings in which an animal is required to predict an agent's behavior by attributing it a perceptual state of seeing as. Such experimental protocols, which make use respectively of transparent color screens, size-distorting lenses, and stimuli inducing amodal completion, are according to him suitable to solve the logical problem for perceptual states attribution. In the last chapter, Lurz proposes a solution to the logical problem for belief attribution. Firstly, he discusses and rejects Davidson's and Bermúdez's arguments against belief attribution in animals. Davidson's argument relies on the assumption that in order to be able to attribute beliefs animals must possess the concept of belief. However, he claims, beliefs are states of an organism that can be true or false. Thus, in order to possess the concept of belief, animals should possess the concept of truth and falsity. However, these latter concepts have an important normative dimension (e.g., in holding a false belief people might be told to be mistaken) and the only way to grasp such concepts is to understand and participate in a public language with shared standards of truth and falsity ascription to sentences. Since animals do not participate in a public language they cannot acquire such concepts. Thus, Davidson concludes, they cannot acquire the concept of belief, and therefore (by his assumption) they cannot attribute beliefs. According to Lurz there are two concepts of belief at issue. The first refers to theact of believing something (act sense), while according to the second (object sense) beliefs are propositions, bearers of truth and falsity. Davidson appeals to the latter sense of belief; however, in the second sense beliefs are not propositions but relations and relations are not true or false. At a minimum, Lurz claims, attributing beliefs requires the act concept of belief. To possess it one must deploy the concept of belief, but such concept must not be the concept of a propositional attitude, as implicit in Davidson. Rather, on the act sense of belief, animals only need to understand an agent as bearing the relation believes-that to states of affairs. Bermúdez's argument, as presented by the author, runs as follows. He does not deny that animals can have beliefs, nor he denies that animals can attribute perceptual states. However, he claims, there is a core difference between perceptual states and beliefs; namely, that perceptual states have a direct impact on the agent's behavior. In order to predict an agent's behavior by attributing a belief, one should be able to work through the agent's practical reasoning (involving other beliefs and desires of the agent, just as her reasoning from beliefs and desires to the action performed), but, in order to work through an agent's practical reasoning, one must be able to think and reason with sentences, in particular with conditional sentences. However, since animals cannot entertain sentences they cannot work through the practical reasoning of other agents. Therefore, they cannot predict their behavior by attributing beliefs to them. Lurz's reply focus on two main points. First, he argues that there is strong empirical evidence against Bermúdez's conclusion. For instance, children are reported to attribute beliefs long before they are able to represent and evaluate logical and evidential relations among states of affair or propositions. Secondly, he rejects Bermúdez's dichotomy between perceptual state attribution and belief attribution. After criticizing the two existing experimental protocols for belief attribution in animals (a cooperative and a competitive "change-of-location" protocol) the author describes his own experimental protocols for testing belief attribution capacities in animals, which, according to him, evolved in animals from perceptual-appearing attribution capacities. In either protocol, the animals are firstly subjected to an appearance-reality task to test their amodal completion capacities – roughly, their capacities to perceive a whole object when parts of it are hidden – and then they are tested on the appositely designed experimental controls, which require the animals to attribute perceptual states and beliefs formed on the basis of such states. Mindreading Animals represents an excellent discussion of the animal mindreading debate and it has all that it takes to be among the most influent books in the future philosophical and empirical research on mindreading. Lurz succeeds in offering a remarkably good and detailed overview of the debate from the perspective of both philosophy and cognitive science. He highlights important theoretical issues, such as the issue of understanding what it means for animals to attribute mental states. The discussion of such issues is particularly important, for not only it shows the relevance of the philosophical reflection for the empirical research on animal mindreading, but it also makes clear that a lack of conceptual accuracy in empirical research can lead scientists to misinterpret the results. A lack of clarity on what mindreading is might indeed lead to mistake behavior-reading abilities for mindreading abilities, an error common to many of the studies discussed in this book. Although Lurz's experimental protocols might not provide a definitive solution to the logical problem, they certainly go a step further than most preexisting experimental protocols with respect to this matter. Worries with these experimental protocols designed by Lurz have been expressed by Halina (2014) and by Andrews (2012). For instance, Halina pointed out that testing animals on complex mental states attribution precludes the possibility to know whether animals are able to attribute at least simple mental states. Lurz proposed to test animals, e.g., on the attribution of seeing as, and argued that if animals were able to attribute seeing as, then they would have been able to attribute the simple mental state of seeing. However, it might be the case that animals can attribute the mental state of seeing but not the more complex mental state of seeing as, and Lurz's experimental protocol won't help to settle this matter. Beside experimental protocols that Lurz proposed, Mindreading Animals surely deserves the attention of philosophers and cognitive scientist for the theoretical discussion on the nature of mindreading. Particularly interesting is, for instance, Lurz's view on how mindreading abilities might have evolved in animals, which might also provide some insights for better understanding mindreading abilities in humans and contribute to the research in social cognition. In conclusion, Mindreading Animals will certainly be of great relevance to the future philosophical and empirical research and it is warmly recommended to everyone interested in animal mindreading and any related topic. Hurley, S. L., & Nudds, M. (2006). Rational animals? Offord University Press.